After five long lean years of budget-cutting and skimpy funding for rebuilding staffing and equipment levels, the department took delivery of a new boat in October to use mainly on Mission Bay to enforce boating laws, improve public safety, investigate accidents and educate boaters. “Our number one job out here is keeping everybody safe,” said Officer Larry Hesselgesser, the senior officer on the boat team whose regular job is community relations for SDPD’s Northern Division, including Mission Bay. He’s excited about the new boat, a rugged, heavy-duty plastic-hulled Triumph 215, for which he developed specs and solicited bids. He served 10 years on the SDPD’s former Marine Unit and now is helping train other officers to operate the boat. But now it’s a part-time, rather than full-time gig, along with other duties. There are no plans to restore a larger, full-time Marine Unit. When the SDPD announced in 2009 it was disbanding its Marine Unit I testified against it to the City Council because of its value to boating safety. But it fell victim to the city’s extended budget crisis and disappeared in early 2010. Two police boats were returned to the state of California, which had provided grant funding, and the full-time Marine Unit’s officers and sergeant returned to patrol duties. The department still had its Marine Unit through most of the “Floatopias,” the drink-a-thons on floating beach toys that attracted more than 6,000 inebriates to Mission Bay until mid-2010 when the City Council plugged the legal loophole enabling drinkers to by-pass the 2008 voter-passed beach alcohol ban. But, down to one boat, for the final Floatopia, the department had to rely more on boats from other public safety agencies. In recent years the absence of regular police patrols on Mission Bay was noticeable, with fewer checks on irresponsible boaters. The Lifeguards’ boating unit, hampered by aging vessels, patrolled whenever they could. 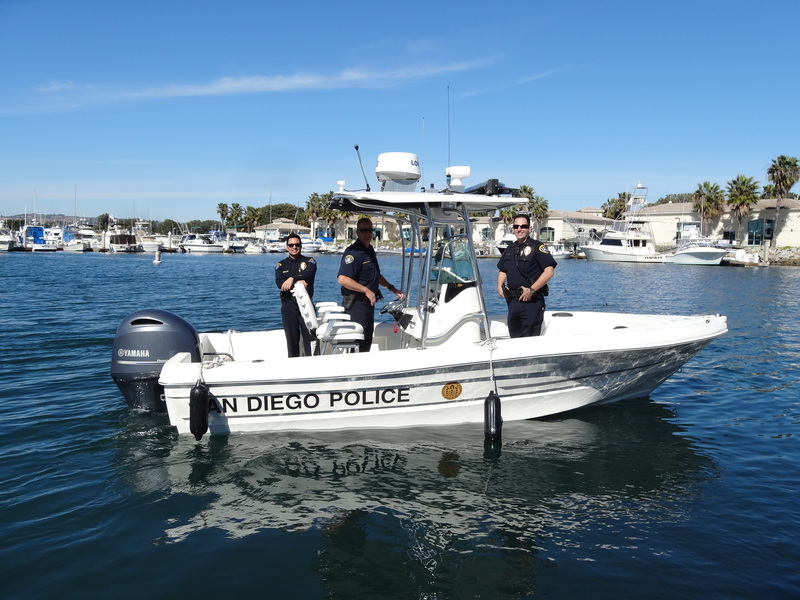 Recently Hesselgesser and two colleagues took me out for a whirl on Mission Bay, putting the speedy new boat through its paces on a short run to the ocean, where the SDPD has jurisdiction 3 miles out. He pointed out its up-to-date electronics, including a chart plotter and interoperable radios able to communicate with all public safety agencies.